For decades, D.C. has been home to two large LGBT– lesbian, gay, bisexual or transgender — celebrations: Capital Pride and DC Black Pride. Folks not tuned into the local LGBT community are most familiar with June’s Capital Pride, a 12-day long event with an award-winning parade through the streets of Dupont and Logan circles and a festival that draws 250,000 people. Meanwhile, DC Black Pride, held over Memorial Day weekend, remains a more low-key event with a festival, poetry slams and a dozen workshops. DC Black Pride started 20 years ago as a celebration and fundraiser for HIV/AIDS organizations serving the black community. Other cities were already hosting such events, but D.C.’s was the first dubbed “Black Pride.” Now, there are more than 30 black prides nationwide, which focus on black LGBT issues. 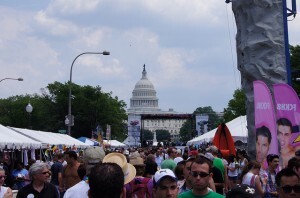 Capital Pride culminates in a festival held along Pennsylvania Avenue. The D.C. event grew popular in the early days as there was “a feeling that Capital Pride was less inclusive at the time,” according to DC Black Pride board member Earl Fowlkes. But since then, events catering to diverse segments of the LGBT community have been held during the Capital Pride celebration. Capital Pride board chairman Mike Lutz says the 12-day long celebration is “very representative” of people of all ages, orientations, races and religions. “Capital Pride is for everyone,” Lutz says. In recent years, Black Pride has scaled back. This year’s event was smaller because the organization plans to host year-round events, but also due to less funding. Meanwhile, Capital Pride has grown in size and demographics. So is there still a need to host a black pride event? “I don’t see it as a separate thing as some people do,” Fowlkes says. “But obviously, whether I felt the need or not, 300,000 people come every year to [black] pride” celebrations around the country. Yet, Fowlkes says he still doesn’t see many people of color attending the Capital Pride festival along Pennsylvania Avenue. 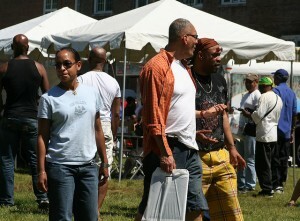 DC Black Pride's festival is usually held in a public park. Now, there’s been plenty of heated debate over whether homophobia is a bigger problem in the black community than in the white community, particularly following the defeat of California’s Proposition 8. But many commentators say homophobia is just as much an issue, if not more of an issue, among whites than blacks. Frank discussions about homosexuality are rare in hip-hop — and the rest of the black community. (Never mind that gays and lesbians are frequently at the heart of religious and cultural institutions, from the church choirs to museums to theaters to dance companies.) Before Wale’s moment, I can’t think of a time when a hip-hop figure (or a Baptist preacher for that matter) was compelled to publicly atone for their homophobia. After all, reggae/dancehall star Buju Banton, who once encouraged murder of homosexuals on wax and continues to taunt gay activists, still has a career. At the festival, Charles Hicks, a 65-year-old community activist, told me the apology showed that ”silent majority” of black people who are against gay bashing are finally being heard. Black and Transgendered? Double the Suffering. I think these kind of festivals are helpful in awaring people about the serious disease HIV/AIDS too along with enjoyment. What you think people? ?